A lot of water has gone under the bridge since our last update and this update is being knocked together on our new laptop. It isn't exactly trouble free but at least it reacts a lot faster! In our last update (in August) we were in a place called Vandenesse and so is the pretty restaurant in our first photo. 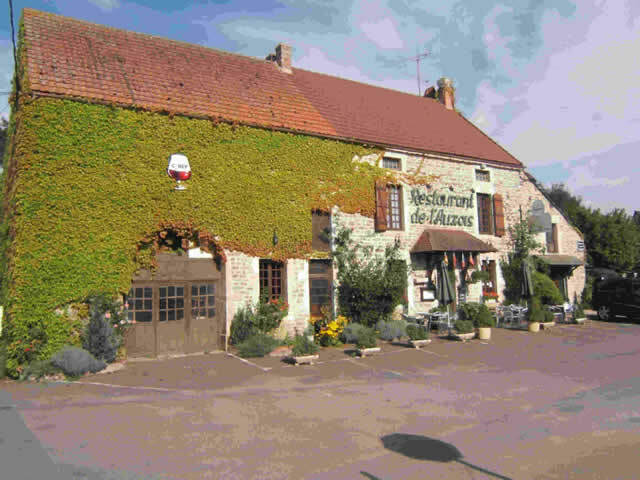 We have eaten there in previous years and the food is excellent. Walking back into Vandenesse one afternoon, we spotted this box for bread ("pain" in French) on someone's front gate. The French find it amusing that we Brits get milk delivered to the front door every morning. But its no funnier than having your daily bread delivered is it? A good bike ride from Vandenesse, I managed to find a supermarket. Generally it is a flat ride of about 6 kilometres along the towpath then a couple more along a main road, maybe 15 or 16 kilometres for the round trip. A very pleasant ride and with the new trailer, its a very fruitful journey. 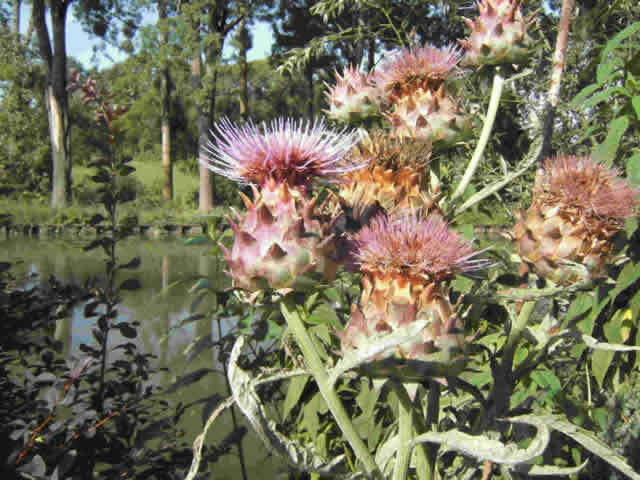 Every lock keeper's cottage is a picture in summer and these giant thistles in our next photo were quite spectacular. Unfortunately, there is nothing in the picture to show the size or scale of them. But we can confirm that they were more than 50 mm in diameter (2 inches in old money). 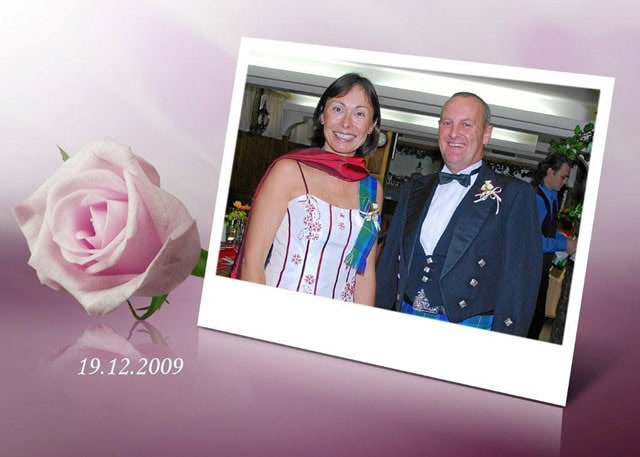 During the spring, we received an e-mail from our friends John and Irene on MOET CHANDON. 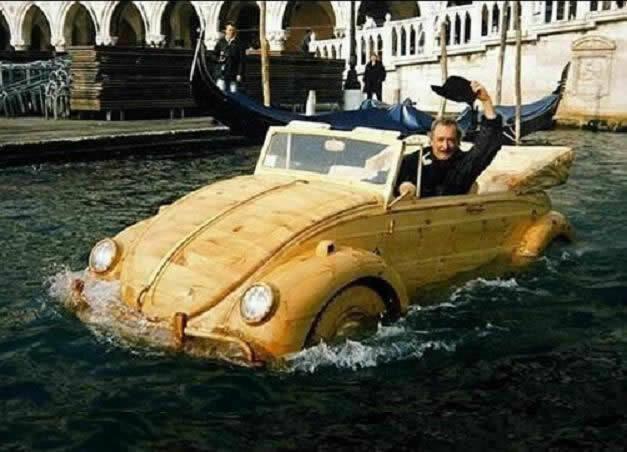 It contained an attachment of this strange boat, which seems to be piloted by someone very familiar!!!!!! Well of course it wasn't, but it even had us fooled for a little while. Summer wouldn't be summer without a continental storm during the hot weather and one night, whilst in one of our favourite places (Pont d'Ouche), we had such a storm. 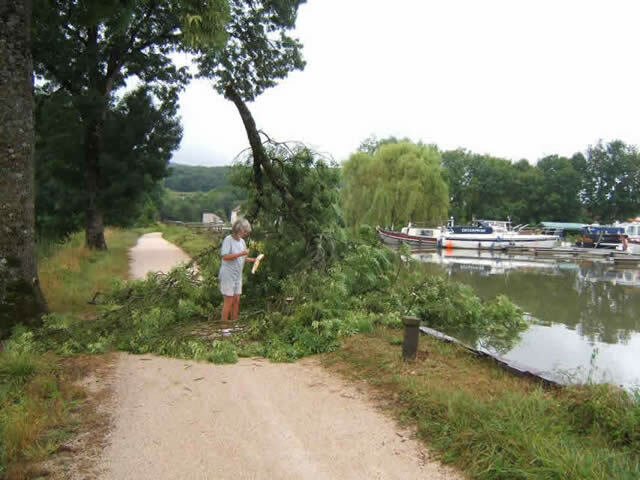 During the storm a bolt of lightning chopped this bough straight off. It was quite funny watching the antics of all who needed to get past it! Much head scratching and ingenuity without actually doing any hard work. It soon became haircut time again (which saves us the price of a meal if we get the hedge clippers out). 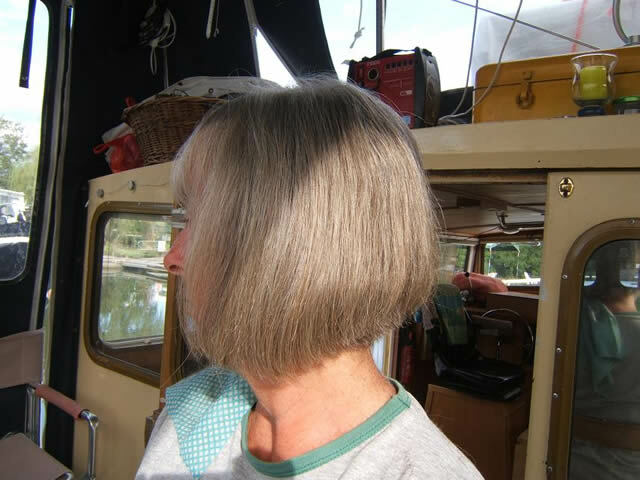 But we are not sure who is most on edge, the barber or the victim and if you do come across us on the canals, please don't ask for a haircut, as I don't need the stress. Spending quite a few weeks in Pont d'Ouche, we met a lot of friends, old and new. One in particular, Phillipe on COCOON, was always smiling and spent most days touring the countryside on his little motorbike and swimming in one of the local lakes. We would finish the day by sharing a bottle of rosé wine with him over at Bryony's café. We found him to be a very generous and humorous man and although he is Belgian we thought his English accent was more Inspector Clouseau than Poirot. 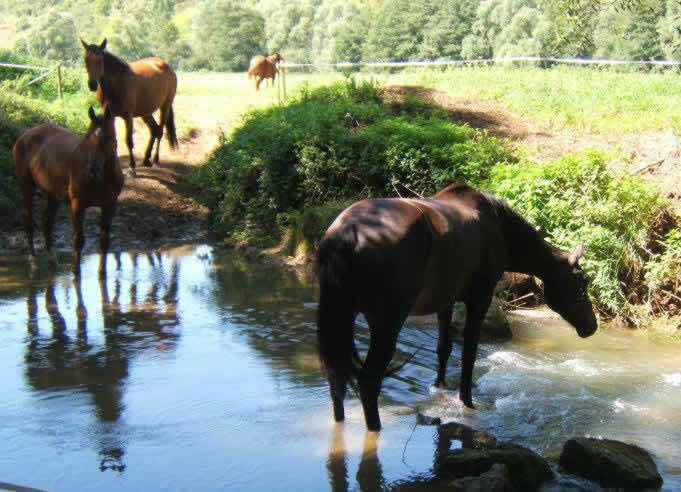 Whilst biking to one of the local villages, I came across these lovely horses. They seemed very content with their lifestyle at this very shady spot. 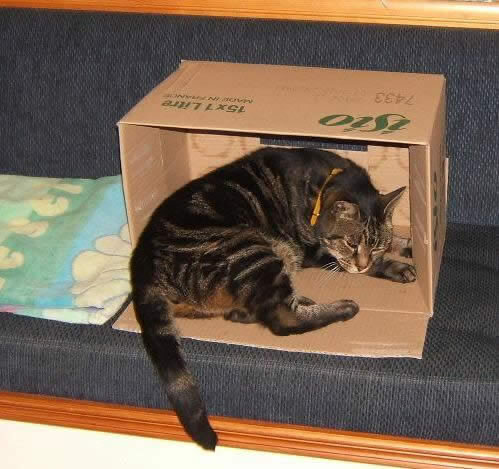 Our ship's cat Gromit also seems to find cosy places to have a nap in. Anything arriving on the boat can be made into a bed with little effort, as you can see in this next photo. Philippe of Cocoon was generally quite happy sight seeing on his little motorcycle and calling for a coffee at a little café or local bar if they had a shady terrace. He was due to make a trip by car to Belgium but before this trip he felt the need to go for a little cruise down the canal. Just for a few days and always within reach of Pont d'Ouche on his motorbike. But after a couple of days Philippe rang to say the gearbox on Cocoon had broken down and and he was unable to move. Cocoon was in full sun, which Philippe didn't like, and he had run out of fresh water. So we decided to go down the canal to try and help him. Not really being mechanical, we thought giving him a tow back to Pont d'Ouche was the best option. But as it turned out, we decided to push Cocoon back and this worked very well. Out of interest, it didn't alter our revs to speed ratio or our acceleration (slow as usual). We did expect to find some manoeuvrability problems over the 2 days. But as long as we kept the ropes between us under tension, everything was fine and we had absolutely excellent service from the lock-keepers throughout the trip. During our stay at Bryony's (Pont d'Ouche) we watched this burst pipe get gradually worse. Bryony had reported it but, as you can imagine in France, "don't mend it if it isn't broken" or "if it's only broken a little bit" comes to mind. Eventually it became quite spectacular and, as you can see, with very pretty rainbow effects. 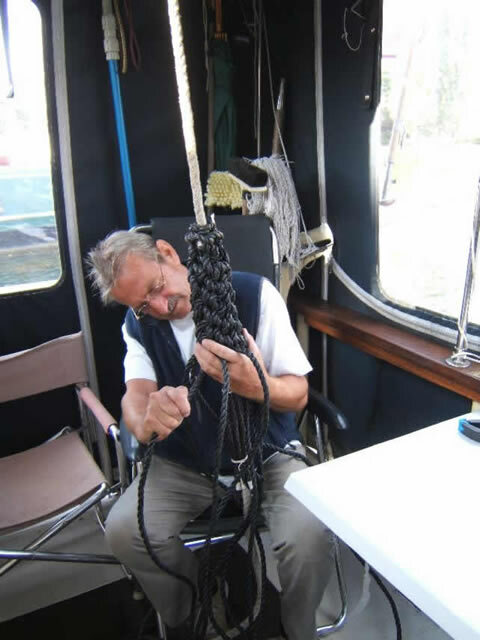 In the spring, before leaving St. Jean de Losne, Chris (Christine) on LIBERTE gave us a load of polypropylene rope. Her husband Roger had bought the rope to make some fenders. But sadly Roger died in the early summer of 2008. There were some instructions with the rope and I'm happy to say I managed to get them finished. During the summer we saw Chris and she said that Roger would be very happy to know that the rope was now in fender form. Coming back towards St. Jean de Losne at a place called Longecourt we spotted this large shed. At the time we didn't know what it was going to be but the roof must have cost a fortune. 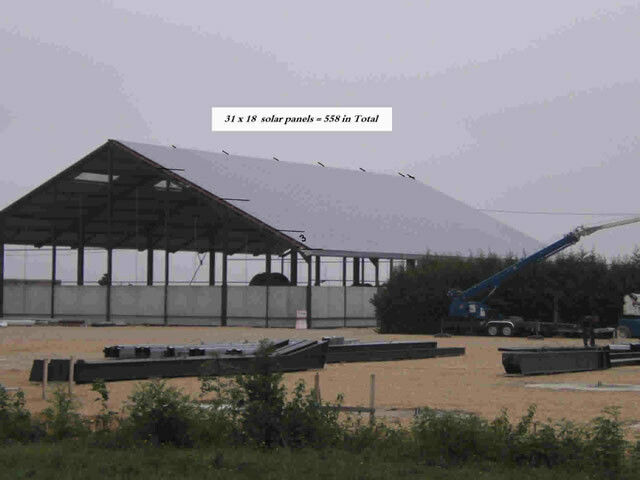 One side is covered in solar panels, a total of 558. 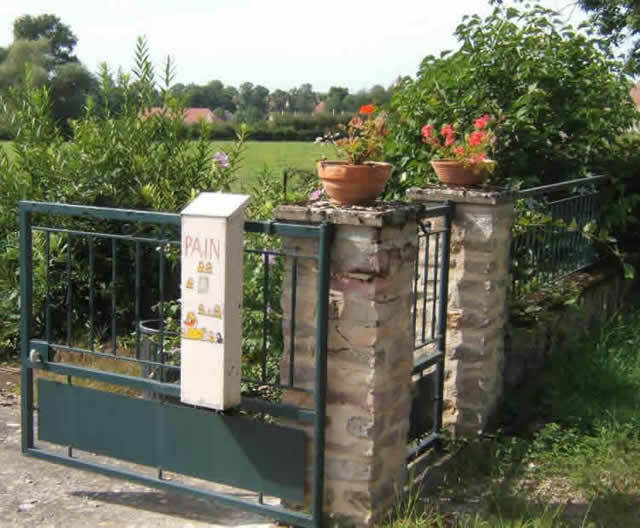 Now we have 2 panels and the average price about 3 years ago was 1000 euros each. So that works out at over half a million euros in panels!! OK, they may have got a discount for quantity - but still a lot of money. We have since learnt that the building is some sort of cow shed and the main part of the electricity is to be sold to EDF (the French equivalent of the Electricity Board). We are often advised by boaters who don't have any themselves that our solar panels"won't ever pay for themselves". But there are added benefits that, for us, make them worthwhile. We just wish we could afford another 2. 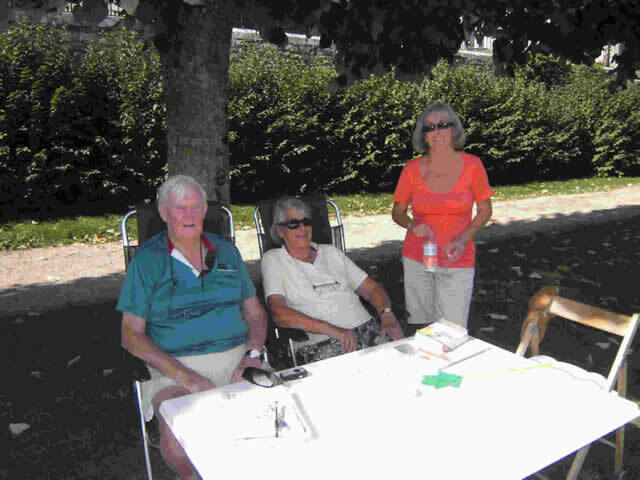 When we got back to St. Jean de Losne in the Autumn, we found that our friends David and Buff were in town. They have a boat called DREADNOUGHT on pontoon D and we first met them in 2004, the year we arrived. This year, they were using DREADNOUGHT as a sort of cottage in France as it had been tightly moored between boats, which made it very difficult to move. 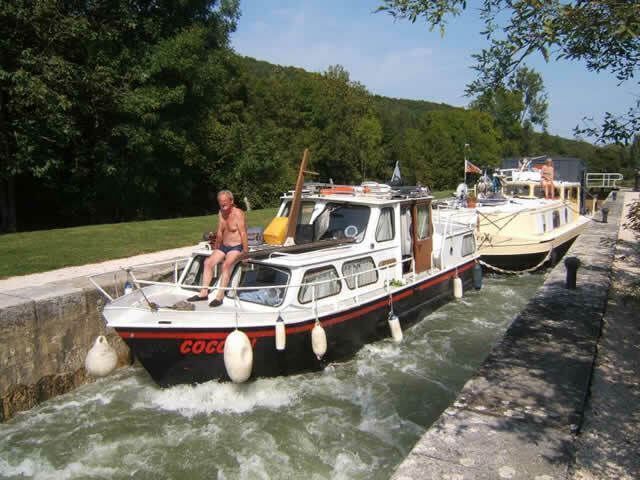 We hadn't finally stopped our summer cruising so we decided that we should all set off on board LEA CREST for a few days up the canal "Rhone au Rhin". 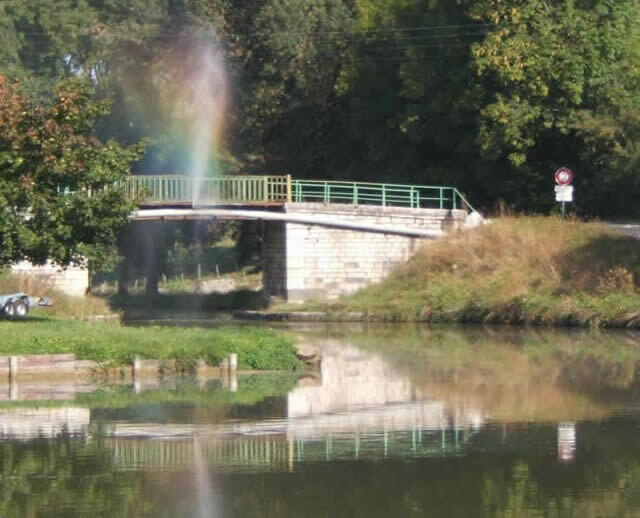 Although it is only a few kilometres from St. Jean de Losne, we had never been on this canal before. It was October and the weather was glorious, as it had been all summer. In fact we think that it has been one of the best summers we have had in France with constant sunshine and little rain to speak of. It was a great little cruise and we know that David and Buff enjoyed it too. 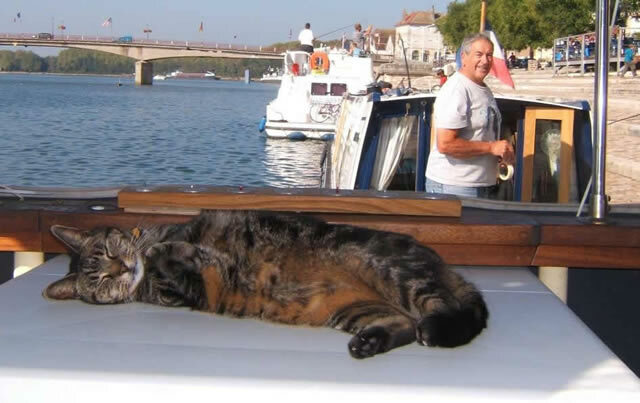 On our return to St. Jean de Losne we spent a little time on the Quayside next to John and Pat on their narrowboat HODDY DOD (which is a word meaning snail if you come from Suffolk). In this next picture, you will see Gromit doing what he does best, while John was out on his front deck. Now John couldn't see Gromit and when I attracted John's attention and pointed the camera in his direction... John put on his most photogenic smile. 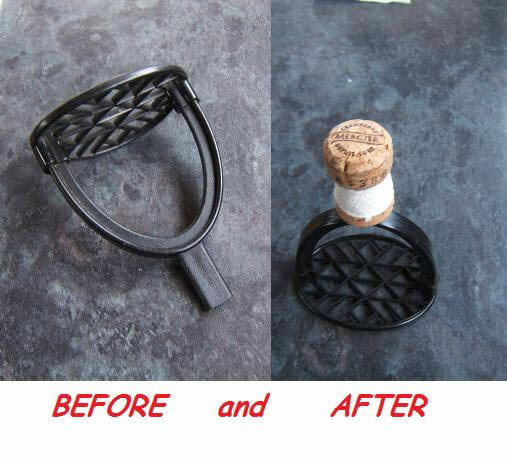 Now something which is very difficult to find in France, is a good old "English" potato masher. So when ours broke due to plastic fatigue, we had a serious problem on our hands. But good old France came to the rescue with an improvised "masher" repair kit. You even get a free bottle of bubbly with each kit! 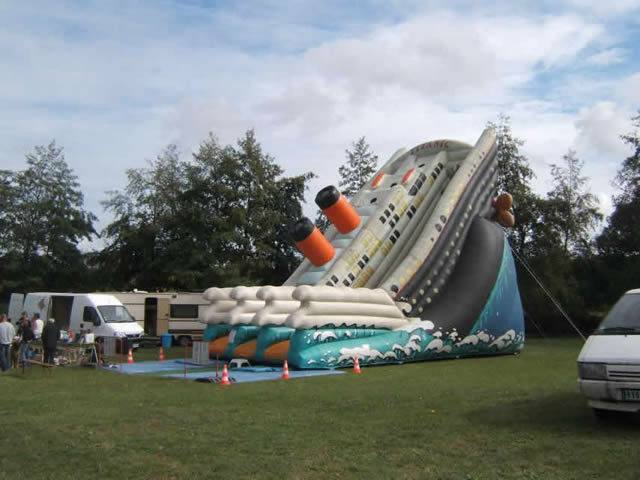 At a recent Vide Grenier (car boot sale) we spotted this children's slide/bouncy thing. Is it bad taste do you think or a clever idea? We are really not sure. 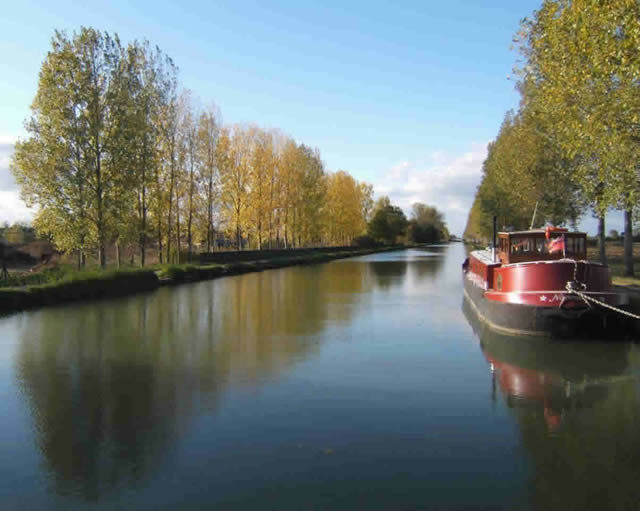 By late October it was time to settle down for the winter and this year we were invited to moor on the Bourgogne canal, outside our friend Jean-Pierre's house. We had helped Jean-Pierre with a few jobs in the early summer and had become good friends with him and his soon wife to be Ilse. We have known Ilse for a few years but had only really met Jean-Pierre during last winter/spring. As you can see from our next photo, the view from our new mooring is very pleasant. It was a big wrench, not returning to pontoon D as often its "better the devil you know". But we have found it to be a very pleasant place to stay. With not too many major jobs to do on LEA CREST, I can spend more time helping 2 of our friends, Jean-Pierre and Gérard. It's good for my French and also keeps me out of mischief. And now, for a 3rd time in this update, here is another picture of Gromit. Maybe even he is getting fed up of Gromit pictures! 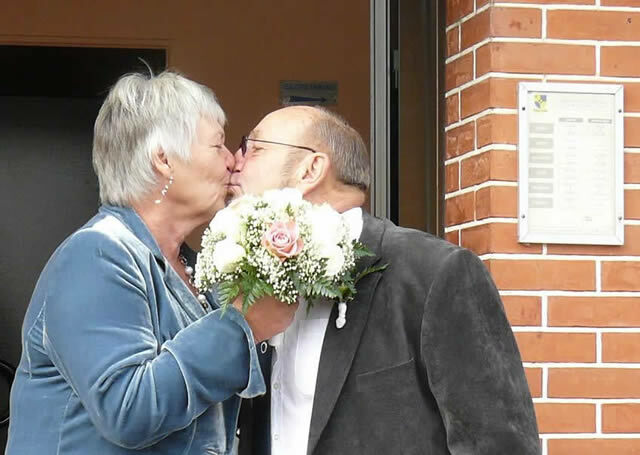 On the 24th October the big day arrived - the marriage of Ilse and Jean-Pierre. It wasn't so much a wonderful day, as a brilliant weekend. 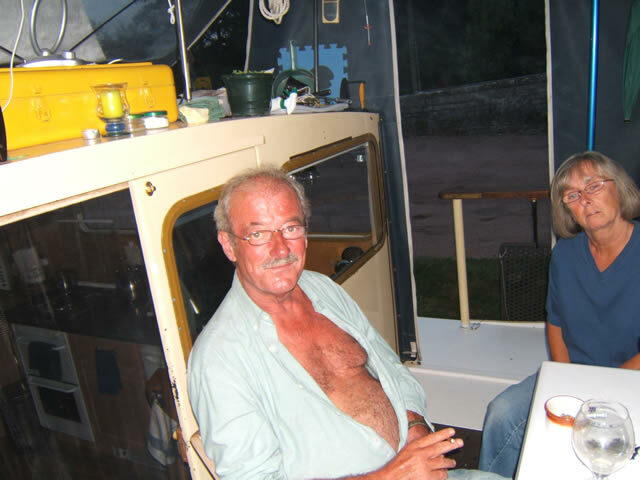 We had 2 of the wedding guests staying with us on board LEA CREST- a lovely couple from Paris called José-André and Irène. It was a very happy weekend and we wish the happy couple lots of happiness. Finally, just as we were about to finalise this update, we received news of yet another wedding. This time it was our friends Ally and Karen tying the knot. They have a boat here in France for the summer and in the winter they have a place in Bulgaria, where the ceremony took place. Good luck to you both and all our best wishes for the future! 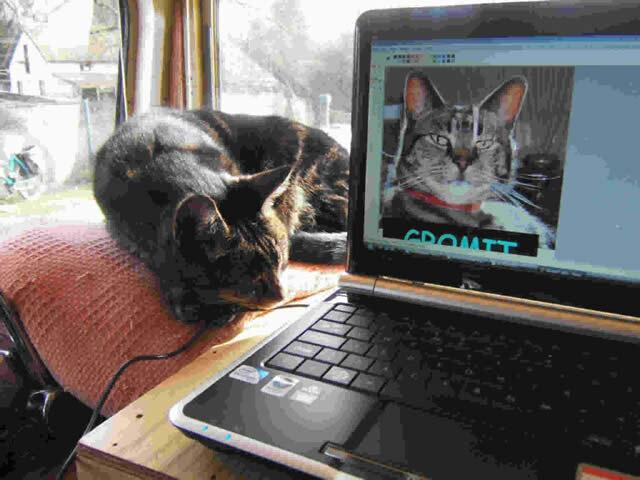 To finish (as we said earlier) we now have a new laptop and Internet access via a 3G+ dongle. The access isn't as good as broadband and although the signal in St. Jean de Losne is good, it is not fast enough for Skype, unfortunately. Tomorrow, we pick up Pamela's sister from Dijon, so we will check the signal there too. Yes, it's nearly Christmas and our update is very late as usual, sorry.